We arrived at the bus station in El Calafate just before 07:45. It was bustling with backpackers and foreign travellers, squeezing past each other, making their way to ticket offices, buses or a rendez-vous with friends or a group. After the quiet backstreets of this little town on the shores of Lago Argentino, it seemed like chaos in the small ticket hall. Already in possession of our bus tickets, bought the evening before from the Cal-Tur office on the main strip of El Calafate, we still had to queue to pay the A$5 per person bus station tax. Once paid, we made our way to the bus, a modern double-deck coach. We squeezed our duffel bags into the crammed luggage compartment underneath then made our way on board, handing our tickets to the genial driver. On board was a generally outdoorsy-looking bunch, with tanned faces and wearing hiking footwear and an assortment of modern alpine-style softshells, fleeces or light duvet jackets. 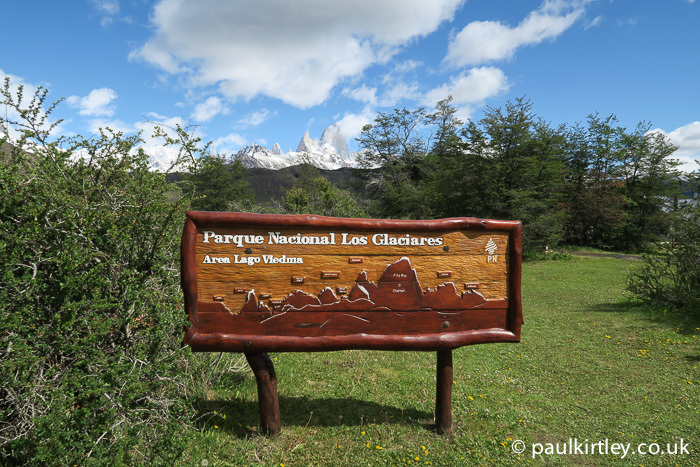 This was no great surprise as El Chalten is the de facto trekking capital of the northern end of Los Glaciares National Park in Argentine Patagonia. 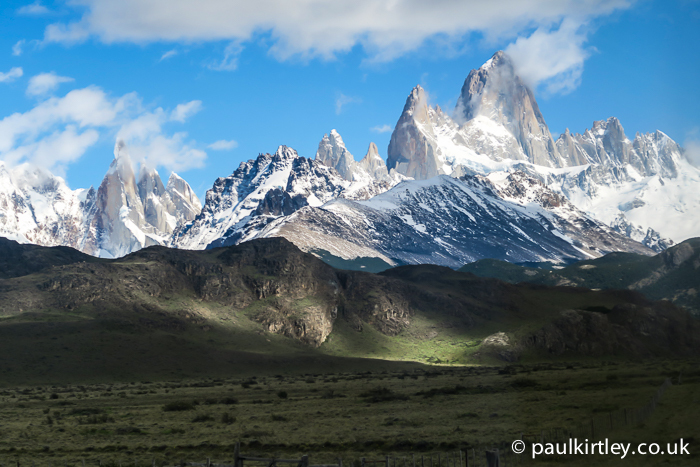 Here you find the iconic peaks of Cerro Torre, Poincenot and Mount Fitz Roy, the jagged ridge lines of Cordon Marconi and Cordon Gorra Blanca, all with their characteristic blades of granite piercing the sky. 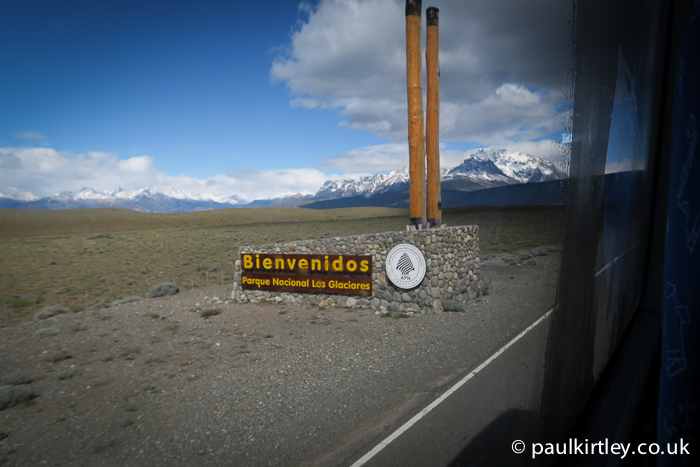 The journey from El Calafate to El Chalten is 3 hours. Starting off in Patagonian steppe, the road leads you to the shores of Lake Viedma. After a while you can see the end wall of Glacier Viedma, which feeds into the north-eastern end of the lake. On a clear day – with which we were blessed – you can also see the peaks and ridge lines. Mount Fitz Roy is notorious for being shrouded in cloud. So we were lucky that we had our fist glimpse of the famous mountain at this early stage of our visit to the area. A clear view of the mountains as we approached. Photo: Paul Kirtley. 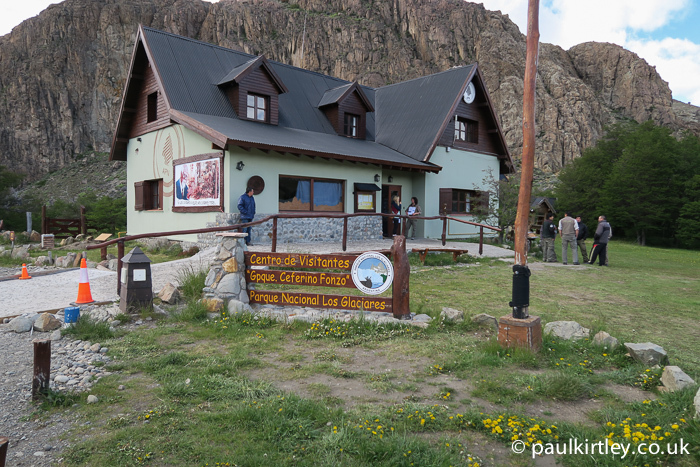 Along the road, around where it diverges from the shores of Lake Viedma, you enter the national park, to which you are welcomed with a brown and yellow sign typical of the Argentine national parks. The road then descends to the small town of El Chalten. On the outskirts of the town is a national park visitor centre. It’s only a few hundred metres short of the bus station but here the bus makes a mandatory stop. A national park ranger boarded the bus, welcomed us to the park and explained, first in Spanish, then in English that we were to disembark to attend a short briefing on the national park, how to behave and how to get the most out of our time in the park. On entering the building, we were directed left for the presentation in English or right for a presentation in Spanish. Using a map, our ranger provided an overview of the main hiking trails in the area, their difficulty level and some pointers as to which ones provided great panoramas (when it wasn’t cloudy) and those that should be avoided in windy conditions. Trail lengths were described in terms of walking time, as opposed to distance – a touch which I liked as it would be generally more useful to most people. He also pointed out that time should be allowed for stopping, taking photographs and having lunch. We should allow plenty of time for our walks, plan to be back before dark but also carry a lamp in case we took longer. He also informed us of the time it currently gets dark. All basic stuff but good, solid advice nonetheless. 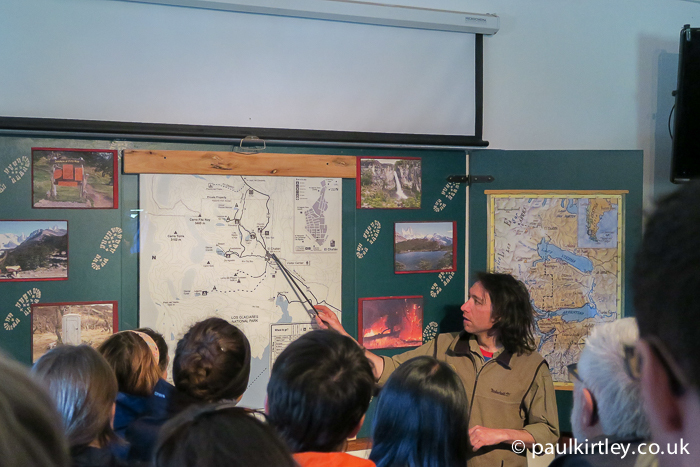 The briefing then went on to explain the existence and location of the various campgrounds in the national park. It was pointed out that these camp sites had no services, therefore all equipment, fuel and food should be carried in. The ranger pointed out that while the weather was very nice today, conditions in the park tend to change rapidly. In particular, winds can pick up to significant strengths. Most of the trails go uphill, towards the mountains and it’s always cooler up there than in town. Even on nice days we should carry waterproofs, spare warm layers, a hat and gloves. With respect to water, the ranger explained you did not need to carry huge amounts as there are plenty of streams and rivers, all of which contained water clean enough to drink. He did, however, highlight points on several day hike routes beyond which there was likely to be no water available. He also stressed the importance of not polluting the water supplies either from going to the toilet or from washing yourself, clothing or pots and pans directly in the water courses. The ranger stated that at campsites, the latrines provided at those sites should be used. Elsewhere, on the trail, it was OK to go in the woods but you should walk at least 50 steps from any water and dig a small hole. All paper should be packed out. Similarly with using soap or washing clothing or equipment, it should not be done in streams or rivers and any suds should not be poured into them. Again, this should be done 100 metres from any water and poured into the ground. The sensitivity of the wildlife to human presence and activity was highlighted. Flora and fauna should be left alone and all attempts to minimise disturbance should be made. In particular, the ranger emphasised that dogs were not allowed on the trails. Bringing this advice to the fore might seem a little strange for an English presentation clearly aimed at foreign visitors, none of whom appeared to have their pets with them. But, like elsewhere in Argentina, there are many dogs in town. These dogs tend to roam freely and will follow you if they think there is the chance of a feed. They are not aggressive but, like any domesticated dog, are quite happy to go for a walk with you. 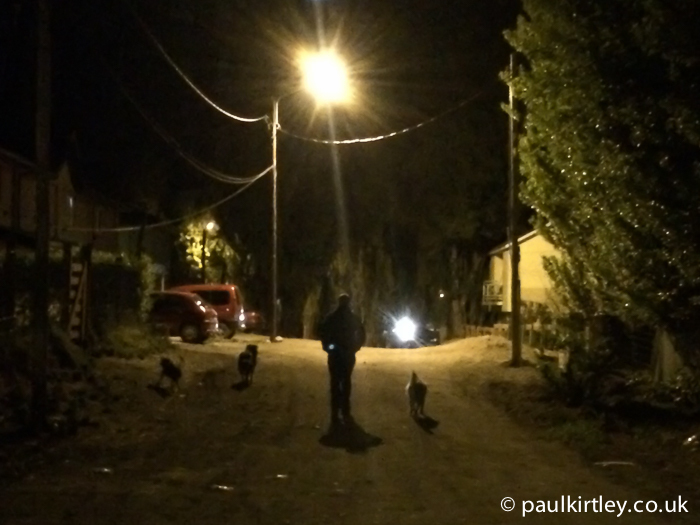 This is something we had witnessed in El Calafate, when we picked up a pack of dogs on the way from a restaurant back to our bed and breakfast accommodation. We figured we’d picked up some food smells from the eatery. They were all lovely dogs and I felt like the dog whisperer. In terms of hiking out of El Chalten, however, dogs following you onto the trails is problem because the dogs disturb the native wildlife. So, we were told in the event of being followed by dogs, to shoo them away before leaving the outskirts if town. We were also requested to let the ranger service know of any dogs sighted on trails. It’s a priority for the service to locate them and take them back to town. 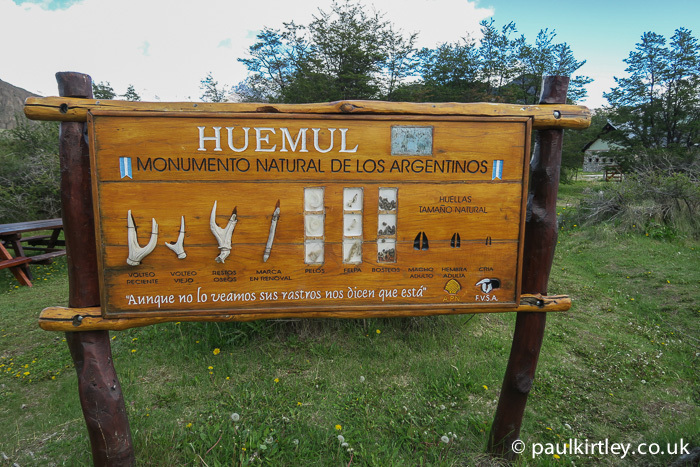 In the park is a healthy population of South Andean deer, Hippocamelus bisulcus, known locally as Huemul. This is an endangered species and their protection is a priority for the national park. The ranger explained the deer are not particularly afraid of humans and will not tend to move away from you when they first see you. But, this leads to uninformed people trying to get closer and closer to take photographs and apparently this infringement on their space does stress the deer. So, we were requested to leave the deer alone if we did see any. It was also asked that we inform the park service of the location of any sightings as they want to register each sighting to keep track the whereabouts of animals. The park service are OK with people hiking off the main marked trails but asked that anyone planning to do so should call in at the visitor centre and register where you intend to go. This is so that you are more easily found in the case of not returning from your hike. It was good to see this responsible approach to leaving word. In the park there is a general leave-no-trace policy. This doesn’t extend to fires though. Fires are completely prohibited in the park. While the area has plenty of streams and rivers, this water is run-off from snow melt and glaciers. The land itself is very dry. 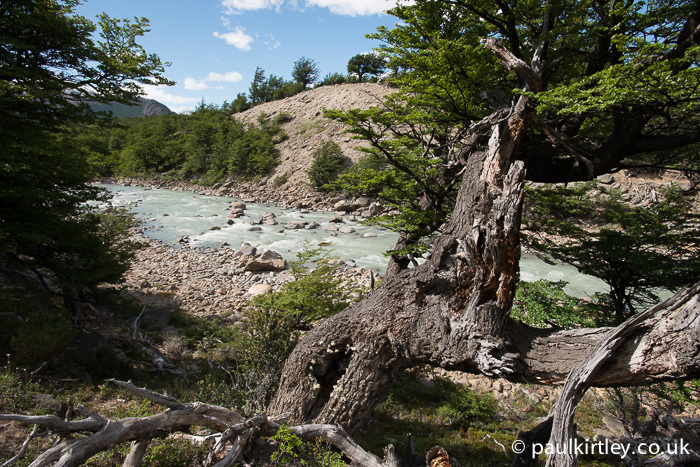 As is all the dead wood in the native Lenga, Nothofagus, a.k.a Southern Beech forests. In dry conditions, the vegetation here is generally quite flammable and forest fires have caused significant habitat destruction in the past. The ranger was at his most emphatic during this part of the presentation. He stated that anyone found with a fire would be “sent to their house. Not here in El Chalten but sent to your house, where you live.” All cooking should be done on stoves. In addition, he stressed extreme care should be taken with cigarettes. Dry conditions. Photo: Paul Kirtley. In keeping with the park’s leave-no-trace policy, hikers are required to pack everything out. This applies to day hikers and campers alike. Everything should be carried back out, inorganic as well as organic. There should be no food waste or even apple cores thrown into the woods. The reason for this is that the ground is dry, it’s generally cold and the break down of organic material takes a long, long time. The briefing ended with the distribution of rudimentary trail maps, which on their reverse reiterated the main park policy points of the presentation as well as the good advice on planning, being prepared and leaving word. I had already bought a topographic map of the area while in El Calafate but it was good to get this park map too as it contained some local information, such as where the good viewpoints are as well as which areas are particularly exposed to wind, that made a good addition to the basic trail routes and topographic information. 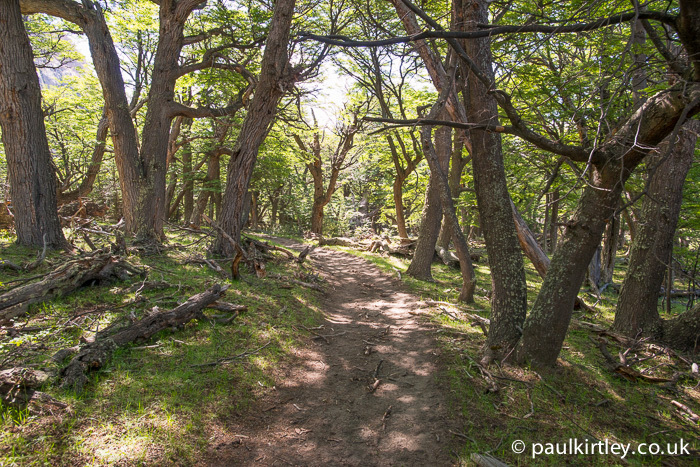 Lenga forest trails… Photo: Paul Kirtley. Following the conclusion of the briefing, we then headed back to our bus, which took us the short distance to the town’s small bus station. I was really impressed with the briefing and the desire of the national park to protect the environment but also its visitors. I think the tone was good and it was informative. Clearly, this type of presentation done incorrectly could be incredibly patronising. But because it was backed up by a clear passion for the place and its conservation, presented by someone who was genuine and sincere, everyone was co-opted into having the same sensitivity. Moreover, it only took 10 minutes. 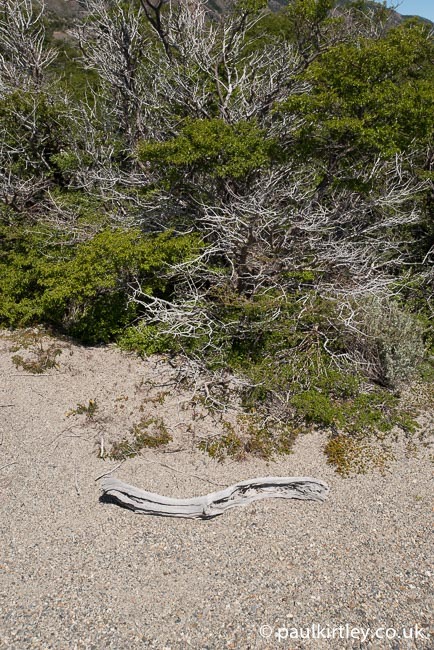 Having seen the mess left by hikers and campers in other parts of the world – both accessible as well as remote – I wonder if this approach should be more widely adopted. It would be an interesting experiment for national parks and other areas which attract significant numbers of visitors to insist on a mandatory briefing for all trail users and campers. Have you experienced this type of briefing in your travels? If so, let me and other readers know in the comments below? Also, do you think this style of briefing would help protect an area you love or perhaps reduce incidences of searches for lost or injured hikers? Lovely article and what a great idea. I think this post really captures the essence of what the briefing was about and it sounds like something that should be considered. Thanks for bringing this to our attention. Think its a great idea, and it would make a difference to how the area is maintained and used publicly. Might also be a good way to highlight specific regional problems or areas that need particular protection such as nesting birds endangered wild flowers etc. Great article! I visited last year and remember the talk well, though didn’t think to bring it back to my ranger friends in the national parks in Canada. It is a fantastic idea! In fact, I don’t recall much litter in the parks in Argentina that we visited. Thanks for the blog and the idea! By the way, you were indeed very lucky to have clear weather. We had clouds and on one of our hikes snow came down quite heavily and quite suddenly -as a Canadian, this didn’t both me in the least and we were well prepared with hat and gloves. Glad you enjoyed your visit also!! Another country where there is a good awareness of conservation when entering their national parks is New Zealand. The Department of Conservation or DOC for short has experienced officers who are really passionate about their work and although there are not exactly organised 10min talks b4 you enter the parks or wildernesses, it is recomended to check in at the local do office where you will get the latest local info on which routes are open or closed (maybe due to landslides/flooding etc). They also have a detailed knowledge of local flora and fauna so you can easily loose 10-20mins chatting about the region. They also have the latest weather updates which are very useful when you are offline.! Great article Paul, sounds like a good proactive approach to conservation and preservation. Rather than moaning park wardens complaining about people’s lack of respect. Did you get the impression the 10 min chat did the trick or fall on deaf ears? Think this is a great idea where most visitors arrive on buses or specific gateways to a park. But oh my goodness the delivery would have to be excellent and as Paul says not the faintest bit patronising or teacherly. I suspect that is quite a talent. May be we should all try putting together such briefing for a favourite area. Its worth doing but i suspect its a bit of an art. So well done folks in Argentina, and in multiple languages too. I believe that this is an excellent article, and the threat of being expelled from the area, if the rule was not obeyed, to be an excellent incentive of obeying the rule. Is there an adequate number of park rangers to effectively police the Park? I think getting the visitors to the park to be taken by the bus ensures that every one get to know the same information, and any questions that persons may raise can be answered the same time. It is a great pity that we do not see that same degree of spirit to control the use of the Amazon Basin. Though it is for commercial use, stringent control needs to be exercised. I say this in passing, as I have read recently of threats to the Amazon Basin, Quite discouraging. I thank you for sharing this information with us and as usual, very helpful and informative. that no-man has ever touched. Good work Englishman, I salute your audience. Thank you for sharing this encouraging information. This is an excellent approach that invites the visitor to share in the care and concern for the environment being they are in. Such an approach is a positive way to ensure that future visitors find an unspoiled place and respect it in their turn. We have something similar in one of my favourite parts of the Pyrenees. During the summer when visitors numbers are high, cars are banned but a car park is provided where a shuttle-bus transports visitors to the trail-head. The shuttle bus pick up point has plenty of free maps on a pamphlet giving the sort of information you describe. The individual human touch is not quite as evident, but the bus people and workers on the nearby base campsite exude care and concern for their place of work and engender an infectious enthusiasm similar to what you describe. Bivouacking is permitted on a leave no trace basis if overnight, but staying in one place for longer is not permitted. Mounted gendarmes patrol to ensure compliance and provide rescue services. I do envy my friends in France and the US in having places left yet unspoiled. How encouraging to learn of another country preserving its wilder areas for future generation. Hi Paul, it’s a great idea! I never had that briefing in visiting national parks in my country and I think it could be solve much problems in order to keep the area clean and safe. Often you can read the same things on wooden tablet at the beginning of the trail but it is not the same….. if someone tell you waht you can do and what you cannot do first to start, you will pay more attention and you will feel yourself responsable.